Grow Your Sales With Checkout - Advertise Now! Checkout is one of Ireland's leading business titles, having been awarded the Best Business to Business Magazine award at the 2014 Magazines Ireland Awards. 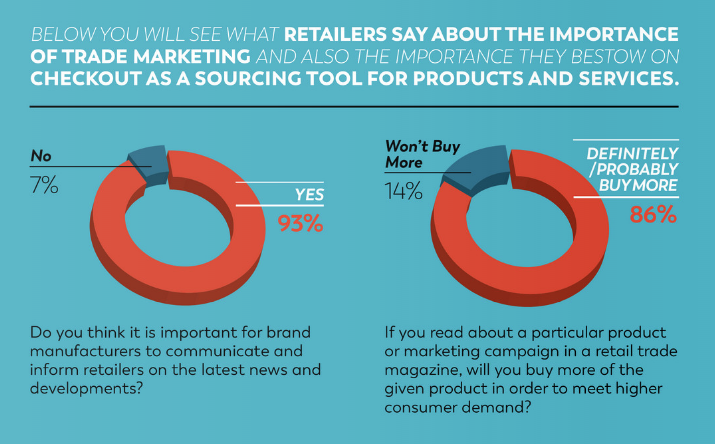 A recent study carried out by Checkout, in association with FMI, found that 90% of retailers would either 'definitely' or 'probably' buy more of a particular product if they read about it in the pages of Checkout. With an unrivalled choice of advertising and promotional opportunities across a range of print and digital media titles, Checkout Publications makes it easy and extremely cost-effective for you to promote your products directly to the trade. Whether you're planning a new product launch or you just want to inject new life into an existing product, choose the brand that can deliver. As the market-leading monthly magazine for the FMCG & grocery retail sector, Checkout delivers a powerful combination of news, research and reference data across a range of print and electronic channels. We can offer our customers an exciting range of unique and totally integrated advertising opportunities combining our award-winning monthly magazine with our hugely successful weekly e-mail-based newsletter, Retail Intelligence. Promotional activity in Checkout can be reinforced with a variety of advertising opportunity on Retail Intelligence, which can link to other external web resources, such as brand sites and other web-based promotional vehicles. For FMCG brand owners, distributors, grocery service providers and retailers, an integrated print & digital media advertising package from Checkout is a winning solution. To find out more about a totally innovative and extremely cost-effective advertising & communications solution for your business, contact our advertising department on +353 1 230 0322 or email [email protected]. To receive a copy of the rate card, please contact the sales team.